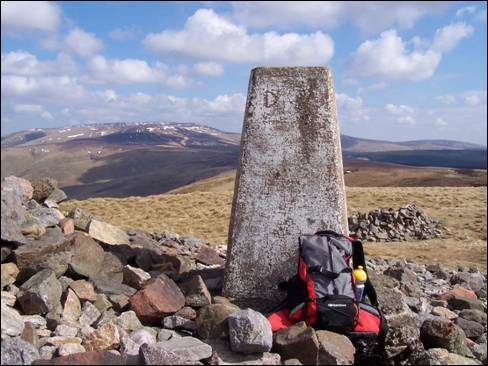 I have been to the 619 metre high summit of Windy Gyle in all sorts of weather. I have walked and run to the top of this iconic hill on more occasions than I care to remember and I have even hauled my way up its windswept slopes on a multi-geared mountain bike. I have never tired of the fantastic, grandstand views from this wild and elemental hill. It was early summer and I was heading to where the Rowhope Burn collides with the River Coquet for the start of yet another journey to Windy Gyle. With the promise of a fine day in store, I opted not to follow either of the two most popular approaches to the summit of this border-stepping hill. Instead I chose to follow the burn-hugging single track road to the farmstead of Rowhope and then to take the blissfully peaceful route over Loft Hill. A splendid dry stone wall guided me away from the valley floor and, as I rose steeply up the grass-covered hillside, the views southwards began to open up. I plodded on and, with firm underfoot conditions, I was soon standing on the summit of Loft Hill enjoying good faraway views. I pressed on towards Windy Gyle, crossing a vast, damp blanket of flowering cotton grass. After negotiating the oddly-named `Split the Deil`, a track historically referred to as Maiden Cross, I clambered over the border fence to reach the triangulation pillar and the summit-embellishing Bronze Age burial cairn. This huge pile of stones was named Russell`s Cairn in memory of Lord Francis Russell who was murdered nearby in 1585 at a meeting of the Wardens of the Middle Marches. The panorama was extensive. I could spot The Schil, The Cheviot, Hedgehope Hill, Bloodybush Edge, Comb Fell, Dunmoor Hill, Thirl Moor and many more besides. The lush, green hills on the Scottish side of the border rolled majestically to the north and west where an intricate lacework of burns and sikes trickled slowly downhill towards the thirsty Bowmont Water. Despite being on the route of the Pennine Way I was utterly alone. As I scrutinized every angle of the outstanding vista I savoured the solitude. I left the summit behind and, as I made my way to the ancient cross-border track known as `The Street`, I wondered if Windy Gyle could possibly be the finest of all the Cheviot Hills. It was certainly a contender!